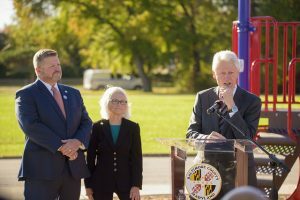 On Monday, October 30, 2017, President Clinton, the Clinton Foundation’s Too Small to Fail initiative and Foundation for Baltimore County Public Library unveiled newly installed “Talking is Teaching” panels at the Sollers Point Multi-Purpose Center Playground in Dundalk. 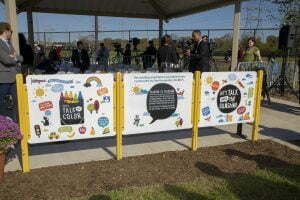 The brightly colored panels were designed to raise awareness among parents and caregivers about the critical importance of talking, reading and singing to their children. 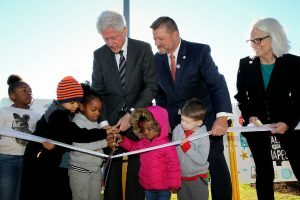 Talking is Teaching: Talk, Read, Sing is a public awareness and action campaign that is part of Too Small to Fail, a joint initiative of The Opportunity Institute and the Clinton Foundation. The campaign helps parents recognize their power to boost their children’s early brain and vocabulary development through simple, everyday actions — like describing things while walking outside or singing songs together during bath time. Research has shown that the more words children hear and learn from parents and caregivers, the greater their chance of success through the preschool and kindergarten years and the more benefits to their lifelong wellbeing. The panels, funded in full by the Foundation for Baltimore County Public Library, incorporate topics that are relatable to preschoolers — bedtime, feelings, colors, shapes, numbers and more — and encourage conversations between parents/caretakers and children in order to get them kindergarten-ready. Signs suggest that playground visitors ‘talk about the rain,’ ‘hunt for shapes,’ talk about sunshine,’ sing about colors’ and more.